If you are one of the many who relies on Gmail as your base of operations then you are no doubt enjoying it’s many productivity-enhancing features (labels, filters, priority inbox, i’m talking to you). But what if the unthinkable should happen? Or you simply want to have the peace of knowing that all your years of email correspondence is backed up safely, somewhere other than in the giant Google brain.No problem! There’s a couple of super-easy options available, i’m going to tell you about 3. IMPORTANT: Step #0: In order for some of these to work you’ll need to log in to your Gmail account, go to Settings (currently under the “gear” menu in the top-right) > Forwarding and POP/IMAP > and select Enable IMAP. Click Save. Did you know that you can use almost ANY email client such as MS Outlook, Outlook Express, Apple Mail, Thunderbird, any email program that supports IMAP email accounts cna be used to keep a locally-stored, searchable, readable backup of all your precious Gmails. Useta be I’d have to tell you specific details on how to set this up like mail server addresses and such. But these days, all the latest email clients seem to support automatic detection of all these settings for your Gmail account. So in most cases you’ll only need to go to the account setting in your email client, add a new account, and enter your name, email address, and password. Once the account has been successfully added, your email program will likely spend a while downloading ALL of your emails. This could take up to 2-3 days! Once all your emails have been downloaded, you now only have to launch your email client periodically, say once a week, or once a month, and let it download all the new stuff. ADDED BONUS (for Apple Mail users): Feel free to download this simple Get New Mail script that will launch Apple Mail, get new mail, and then close Apple Mail. You can even schedule this script to run by firing up iCal, and creating a new repeating event. Under the alarm menu choose Open File… and select the Get New Mail app that you just downloaded. DISCLAIMER: As one user pointed out to me, GMAIL BACKUP MARKS ALL MAILS AS READ. So if you are using the unread message status as some sort of “filing” or organizational system, watch out! 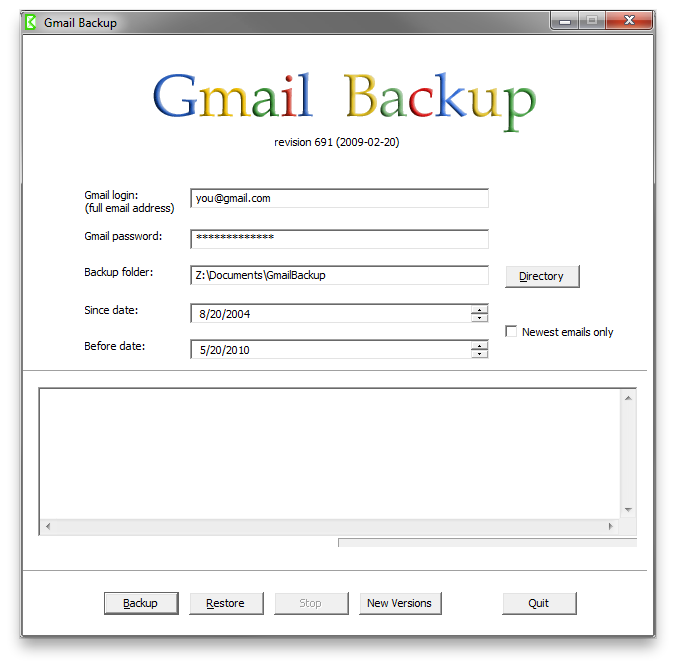 A simple interface and quick setup make Gmail Backup a highly recommended tool for any user. Simply provide your login info and make note of where the backups are being saved to. To perform a complete backup of ALL your email: For “Since date” you can enter some date way in the past, before you even had your gmail account. For “Before date” enter tomorrows date. That’s it! Hit “Backup” and go about your business. This is going to take a while. Once you’ve got all your emails backed up you can re-run Gmail Backup periodically and only backup the emails accumulated since your last backup. To do this, adjust the “Since date” to the date of your last backup. As of this posting, the latest version of Gmail Backup is 0.107 (click this link to download Gmail Backup). Another neat trick that you can pull with your locally backed up emails is to use MS Outlook or Thunderbird as an email archive “browser”. Gmail Backup stores your email archives as .eml files, which can be opened with most email clients. And now for something completely different, Backupify offers a completely web-based approach to backing up not just Gmail, but a large chunk of your online life including flickr, Facebook, Google Docs, and now Google Calendar too. But let’s just focus on Gmail. To get started: You’ll need to sign up for a free account with their service. Once you’ve verified your new account, log in to your Backupify dashboard and take a look at the list of service available to be backed up. Like Gmail Backup, setup is crazy-simple to get running. Unlike Gmail Backup, once up-and-running, Backupify is completely automated. In the list of Services find Gmail and click “Add”. Enter in your Gmail login info. If you have more than one Google account you’ll be asked to specify one to allow access for the backup service. Backupify uses Google OAuth which allows you to grant them access to your account without sharing your personal login info with them. You’ll receive an email notification after your account has been successfully backed up. In 2 or 3 days. The big shift from Gmail Backup is that you don’t automatically get a copy of all your backed up data on your hard drive. It’s still backed up in the cloud (like Gmail, just in a different cloud). Here’s the one major flaw in Backupify: No bulk download or bulk restore of your email. You can however restore individual emails directly into your Gmail inbox, which is kinda nice i guess. Hopefully they will make these features available SOON! Are you listening Backupify?…. If you like the security of knowing that ALL your important emails are backed up on your hard drive (which is also being backed up, right?) then the more manually operated Email Client or Gmail Backup methods are for you. If you like hands-free, set-it-and-forget-it email backups, check out Backupify. Not to scare anyone but: Google does accidentally delete things from time to time…. You could also look into Larch.